This will be my last blog post until July 6th or so, when I get back from the McDougall "Celebrity Chef" Weekend in Santa Rosa, Ca. I'll be in good company, with Chef Kevin Dunn, executive chef and creator of the Vegetarian Awakening vegan chef's conferences; Susan Voisin from the fat free vegan blog; Colleen Patrick-Goudreau from the Compassionate Cooks blog; Jill Nussinow, "The Veggie Queen"; Miyoko Schinner, author of "The New Now and Zen Epicure"; and Chef Eric Tucker of Millennium Restaurant in San Francisco. Wow! We will all, along with Mary McDougall, be demonstrating flavorful, no-fat-added recipes for the participants to recreate at home. I'm doing a workshop on breakfast foods on Saturday morning, and a work shop on "The Elegant Bean" on Sunday. So, I'll be filling you in when I get back! In the meantime, I'm posting a delicious eggplant dish that I made the other day. A medical practitioner recommended that my husband eat more eggplant. Now, I've been telling him that for ages, because eggplant is a great source of viscous fiber-- "the 'sticky' type of soluble fiber found in oats, barley and beans, and certain vegetables such as okra and eggplant. Viscous fibers help binding the cholesterol in your digestive tract and sweep it out of your body. In another word, soluble fiber act as a sponge, absorbing cholesterol and carrying it out of your system. People at less-developed countries (such as China) are less prone to having high blood cholesterol because their diet are high on viscous fiber." http://foodheal.blogspot.com/2006/07/eating-to-lower-cholesterol-1-viscous.html You can read more scientific stuff about this here, and about the "Portfolio Diet" which followed that research. 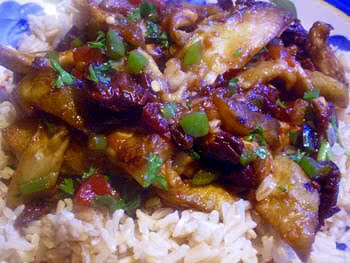 I love eggplant, but DH has only eaten it reluctantly, except when I make Szechuan eggplant, which he does like. So I thought I'd start out with a stir-fry. I found the following recipe on a great website called "Ashbury's Aubergines" that has thousands of eggplant (aubergine) recipes! 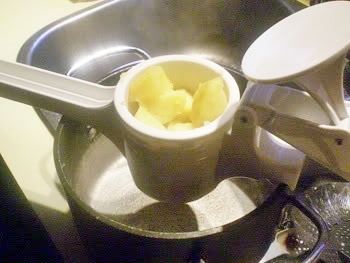 I wanted to cut down the oil a bit, so I experimented with a technique I read about in Cook's Illustrated magazine. Eggplant soaks up oil like a sponge-- as the authors say, "it's essentially a sponge, ready to absorb anything, and it's packed with water. This one-two punch transforms the eggplant into oil-soaked mush before it has a chance to caramelize." "The Solution: First we needed to dehydrate the eggplant, but the traditional salting method didn't sufficiently dry it out. Combining salting and microwaving did work— after we put a few disposable coffee filters under the eggplant to keep it from poaching in its leached-out liquid. The eggplant (now reduced to a third its original size) could be sautéed in a much smaller amount of oil (1 tablespoon vs. nearly 1/2 cup). The eggplant plumped up nicely when added back to the other vegetables to stew, absorbing these other flavors instead of just oil." So, what you do is, cut your eggplant into chunks or strips and toss it with a bit of kosher salt in bowl. 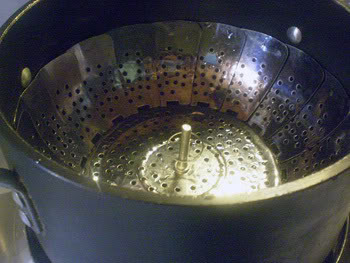 Line entire surface of large microwave-safe plate with double layer of [unbleached] coffee filters and lightly spray with oil from a pump sprayer. Spread the eggplant in one even layer over the filters. Microwave on high until the eggplant is dry and shriveled to one-third of its size, 8 to 15 minutes (the eggplant should not brown). (If your microwave has no turntable, rotate the plate after 5 minutes.) Use in your recipe. It worked! This was delicious and DH loved it, even though heclaims to hat eggplant. Heat the oil in a large skillet. Add the garlic and jalapeno pepper and cook over high heat until the garlic is soft. Add the sun-dried tomatoes and prepared eggplant (see text above). Turn the heat to medium. Cook and stir for about 5 minutes until the eggplant is tender. Add the soy sauce, vinegar and sugar to the skillet. 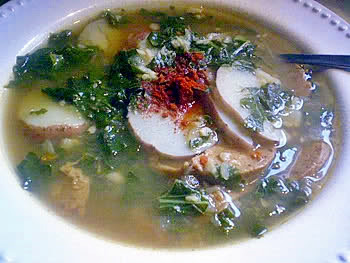 Cook until the liquid is almost absorbed. Add tomato and parsley or cilantro. Stir to combine. Remove from the heat. 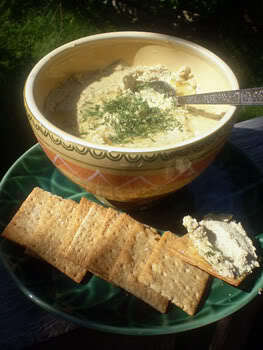 I served this with brown basmati rice, but it would be great cold with baguettes or pita bread or rye crisp! VEGAN WHIPPED CREME, MARSHIE FLUFF-- THE POSSIBILITIES ARE ENDLESS! Only 27 calories per 1/2 cup! Strawberry Shortcake with the above "whipped creme"
Vegan "Marshie creme or fluff"-- a spin-off from the "whipped creme" recipe! UPDATE: The recipe is on this blog post! It's sweet, sticky, fluffy and it lasts! I couldn't resist trying it on small fat-free chocolate cakes (Light and Easy Chocolate Cake from my book "The Almost No-Fat Holiday Cookbook". Can you see why we're excited? But there's alot of work to do, perfecting the recipes, figuring out the limitations, and the possibilities. Souffle? Angel Food Cake? Meringue? Pavlova? Mousse? Rocky Road Ice cream? Good thing there's no fat involved, or we would turn into blimps! So stay tuned to both my blog and Julie's for more developments! I promised to post a few more okara recipes (well, 2 anyway! ), and I'm posting one here today, but I have to wait until I get some raw cashews so that I can make my other favorite okara recipe and take a picture of it! 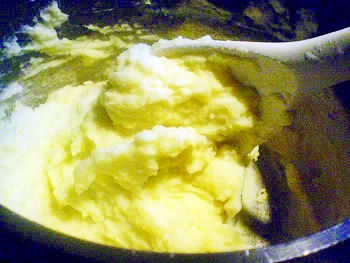 Anyway, the following recipe is a variation of a variation! The original was from The Book of Miso. I revised it to my own tastes many years ago and my version (with credit to the original) was published in my book, The Fiber for Life Cookbook. 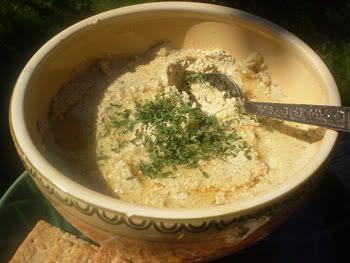 It is much more delicious than its’ humble ingredients suggest, and it’s great on crackers or rye bread or French bread. 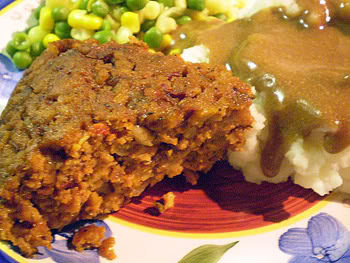 Adapted from a recipe in my book “The Fiber for Life Cookbook”. 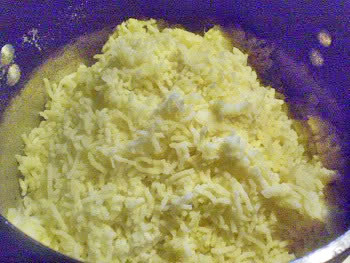 In a small bowl, mash the water and breadcrumbs together with a fork until the crumbs absorb all the broth. 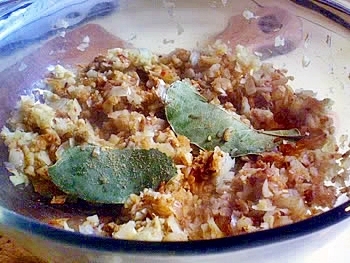 Mince the onion and garlic in a food processor. Add the other ingredients and process JUST until everything is mixed. 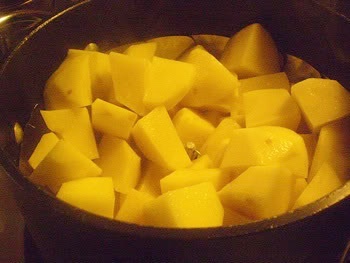 Pack into a small serving bowl, cover and refrigerate for AT LEAST one hour (preferably overnight) before serving. If you like, drizzle the top with a little roasted (Asian) sesame oil or extra-virgin olive oil, and sprinkle with minced green onion or parsley before serving.